The panda is a protected species, but more than that it is arguably one of the most beloved animals worldwide. Celebrate this adorable creature and a famous series with the Chinese Silver Panda iconic image displayed in pure 24 karat gold against a black ruthenium background. 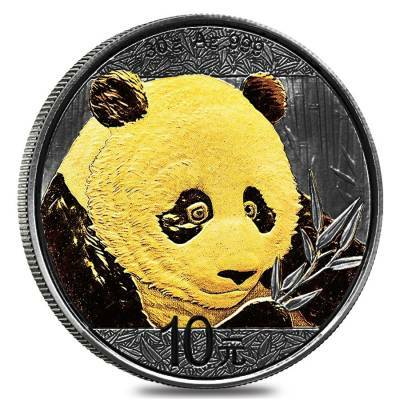 This is a truly memorable coin and an exciting new look for such an iconic series. The Merrick Mint is renowned for its releases that are unique and catered to the specific interests of their customers. They offer coins commemorating pop culture figures, superheroes, national sports leagues, and history. 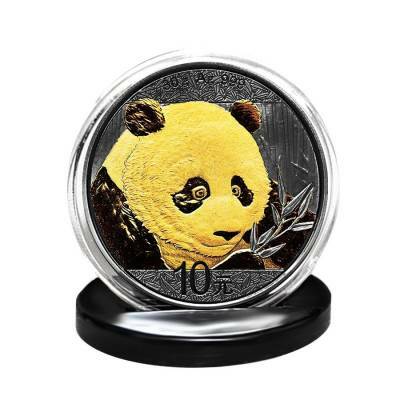 Celebrate an exciting new release with a coin which offers a completely new kind of divisibility to your portfolio. Made from .999 fine silver with a weight of 30 grams. Obverse: Showcases the China landmark Beijing Temple of Heaven - the Temple of Heaven and its Hall of Prayer for Abundant Harvests, in gold. 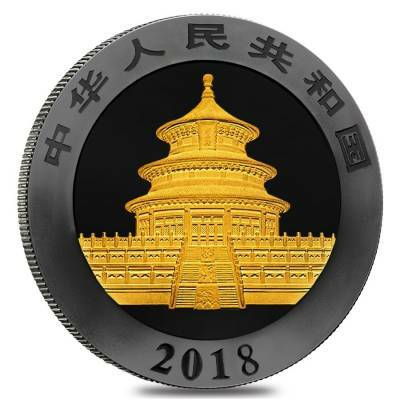 Inscriptions: Chinese characters for "People's Republic of China" and the year of mintage, all shown in deep black ruthenium. 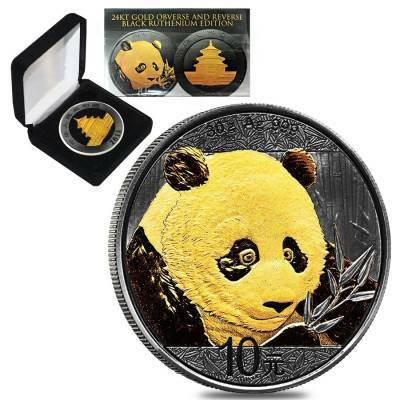 Reverse: Features the globally recognizable image of the Chinese Mint’s Panda series, of a detailed and close up look at a panda’s face, clutching bamboo in one paw, shown in stunning 24k gold against a black ruthenium coated background. Inscriptions include the weight, purity, and face value. Bullion Exchanges offers you a wide selection of exclusive items from renowned international refineries. Add this commemorative new release to your collection today, and it will be carefully wrapped, packaged, and delivered to your address. If you have any questions, please send us a message through our convenient web portal and our friendly associates will be happy to assist you. I got my Ruthenium Panda Coin in just a few days with Bullion Exchanges' safe shipping. I was very happy to get this item at such a convenient price compared to other companies like Apmex and JM Bullion. We currently have 20 of this item in stock.